Hauser & Wirth is pleased to announce Bharti Kher's debut solo exhibition at our London gallery. In her art, Kher gives form to the slightly strange and slightly awkward encounters with the daily rituals of life. Her vision makes the banal wondrous and the quotidian unusual, sometimes even disturbing. Her use of found objects, such as mirrors or furniture, is informed by her own position as an artist located between geographic and social milieus. Her way of working is exploratory: surveying, looking, collecting, and transforming. By bringing to attention the overlooked world with its everyday acts, such as applying the bindi in Indian culture, confessing as a ritual or looking at oneself in a mirror, and then re-assessing their meaning, Kher's work repositions the viewer's relationship with the object. An arcane symbol of fertility, the contemporary stick-on bindi is a popular cosmetic device available in different shapes and colours and is an integral part of Kher's Š âuvre. Exploiting their cultural and aesthetic dualisms, Kher uses bindis as an epidermal filter to transform objects. As shimmering signs in the form of waves, constellations, and spirals, Kher's bindis mediate between codes and symbols and the ritual marking of time. 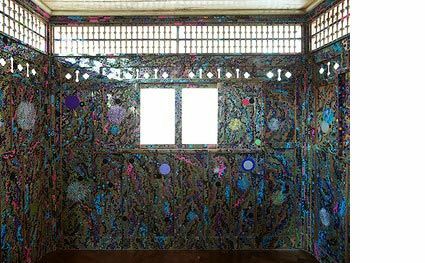 In the main gallery will be âconfess', a room whose interior surfaces are animated by oculi-like feminine bindis, providing a boisterous, almost pagan, counterpoint to the hushed rituals of the confessional. The single light bulb hanging from the ceiling brings with it images of forced confessions in prison cells. The claustrophobia of the domestic realm, a persistent theme in Kher's work, finds parallels in the staged decorum of the church with cupboards that whisper secrets that oscillate between truth and lies. Upstairs, a motorised rocking horse is transformed into a unicorn, its horn marking the arc of time. In âcontents', a series of medical charts veiled by a diaphanous skin of bindis, Kher plays with the paradoxical nature of the sperm-shaped bindi, at once masculine and feminine, mainstream and esoteric, enduring and ephemeral. Multitudes of these markers provide a psychic filter to the medical charts by drawing our attention to the often painful and unpredictable realities of birthing and the awkwardness of dealing with abnormality both psychologically and genetically. Kher's fascination with the interiority of things, from the sanctuary of a private space to cross-sections of a birthing body, brings her unfolding process to the heavily contoured form of a mountain surgically split along a fault line revealing dark, smooth surfaces. Entitled âinevitable undeniable necessary', the sculpture suggests the impermanence of seemingly immutable objects and the potential of interior rhizomatic space to challenge hierarchic thought. The artist's metaphysical explorations are made palpable by âin the presence of nothing'. A type of standing bell, the singing bowl is used to induce meditation and support chanting in Tantric Buddhism. Replacing the monk, a mechanical rod powered by a visible motor rubs the mallet around the rim of the bowl to produce a continuous âsinging' sound. By placing the bowl in the vault (the gallery is housed in a bank designed by the architect of New Delhi, Edwin Lutyens), Kher initiates a dialogue between metaphysical and material pursuits, absence and presence, while simultaneously marking a specific historical context. âcholeric, phlegmatic, melancholy, sanguine', Kher's new sculpture to be shown in Southwood Garden, St. James's Church, bristles with contorted mask-like faces and tentacles, looming with the spectacle of a woman impaled on one of her arms. In a clever inversion of the creation myth which begins with the churning of a sacred mountain by a serpent, Kher offers a quid pro quo of creation and sacrifice. This new work documents a terminal moment, an infernal grotesque form of a Kali goddess who represents the dissolution of an era where all karma and ego end.